I’ve previously written about ways to make your kitty’s trip to the veterinarian less stressful for everyone. Our feline friends sometimes do not receive the medical care they need and deserve, because it may be unpleasant for owners to try and wrangle Fluffy into her cat carrier. There are many strategies that can be implemented to get Fluffy acclimated to her carrier. 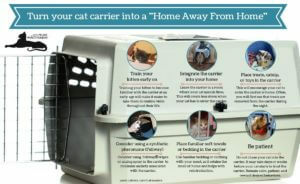 The American Association of Feline Practitioners (of which Dr. DiGiacomo is an enthusiastic member) has provided a simple list of ways to ensure Fluffy’s carrier is a comfortable, familiar place. It’s as simple as leaving the carrier out in the open, so Fluffy desensitizes to it, while providing high value treats and toys inside the crate. Allowing Fluffy to come and go, and investigate the carrier on her own terms is important to make the carrier a “happy place” for Fluffy (and not just a place where she is forcibly confined one time a year when she needs a visit to the veterinarian!) At Newtown Square Veterinary Hospital, we are happy to talk about a variety of strategies to make Fluffy’s visit to us less stress-filled and more fun-filled!